Last month we did things a little differently by putting the gears inside the comments below to make it easier for you to comment on individual gears. I think there were some benefits to it, but let's try it out the other way. With the exception of a few F1 races and the odd racing McLaren F1 or vintage Can-AM car, it's been a while since we've seen racing McLarens here in the United States. 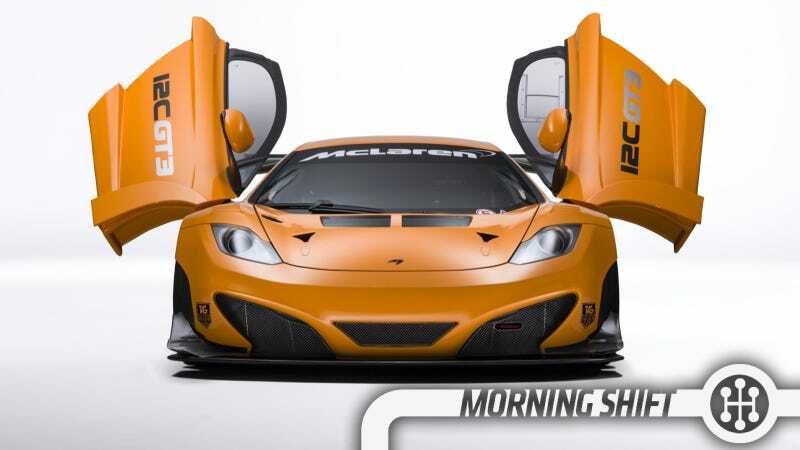 Watch yo back, fools, the McLaren is coming back. Specifically, the 12C GT3 is now approved to race in the Pirelli World Challenge, which is what runs ahead of IndyCar as a support series. Because it's an SCCA-sanctioned event, I'm just going to assume that means you can run it in your local autocross… right? That's how that works, isn't it? If you're the first team to buy this car I insist you keep it orange. The inaugural GRAND-AM of The Americas at Circuit of The Americas (I guess they couldn't have made the name any longer?) seems like a success with 26,648 fans over two sunny-yet-cool days. Many more porny images to come, but let's just run through what happened. In a win for Texans, the Dallas-based #99 Corvette DP managed to hold on to a victory after the Starworks Motorsports car took a bump and landed in the gravel. Turner Motorsports pulled off a GT win in the BMW M3 and the BGB Porsche Cayman claimed the top spot in GX. If you were curious, a Mazdaspeed 6 managed a second place finish in GX. The key word is "finish." 3rd Gear: How'd The CLA Get So Cheap? An interesting look today from Automotive News that details just how the Mercedes CLA managed to nose under the $30K. For one, they made it FWD. Two, they seem to have all swallowed that their profit margin is going to be smaller in exchange for new customers and brand loyalty. The biggest piece, probably, is that they're building the car in Hungary. Hey, we can relate! The U.S. team had something else going for it: The CLA would be built in a new factory in Kecskemet, Hungary. Labor costs in Hungary are lower than in Germany, where the previous generation A and B class were made. Also, the new factory will make several models using a new flexible architecture. Kia's decided to call their new, tiny, Juke-like thing the "Provo." That's a weird name for a lot of reasons. I think of Provo, Utah. And when I think of Provo, Utah I think of Norman Mailer's "The Executioner's Song" about the Gary Gilmore murders. A weird book, a good read, a terrible association with a car. its bombing and shooting campaign in the 1970s and 1980s." Provo apparently will always be associated with violence. The name came out of Frankfurt, it seems, and no one there considered the violent associations. There's a good joke in there somewhere. As always, a lot of the pain from the Carpocalypse and managed bankruptcies landed squarely on the workers. One of the ways the UAW and GM tried to deal with workers was to transplant them to other factories. Many of those workers have now been relocated back home, decided to stay where they were, or took other gigs. But, as The Detroit News points out, there are still about 220 workers who haven't been so lucky. "I tell people it's the most miserable broke and lonely I've ever been in my life," she said. "Because the finances are so tight, you don't do anything but work. Every extra penny goes back home to take care of your responsibilities there. There's not a lot of fun."